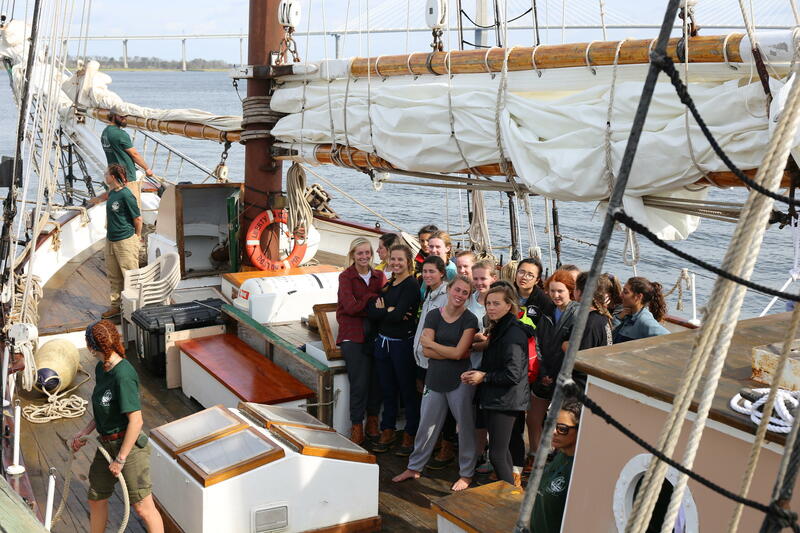 Just leaving their cell phones behind for a week might seem tough enough, but 17 teenagers from Ashley Hall in Charleston, a private school for girls, spent a week at sea hoisting sails and navigating by stars aboard the tall ship, “Liberty Clipper”. Most had never sailed before. The trip is part of the school’s annual Offshore Leadership Program. This is the 11th year students have sailed. Anne Weston, the school’s assistant head, has been on the voyage twice. Listen: Families reunite with teenagers who spent a week at sea as part of a school leadership program at Ashley Hall in Charleston. 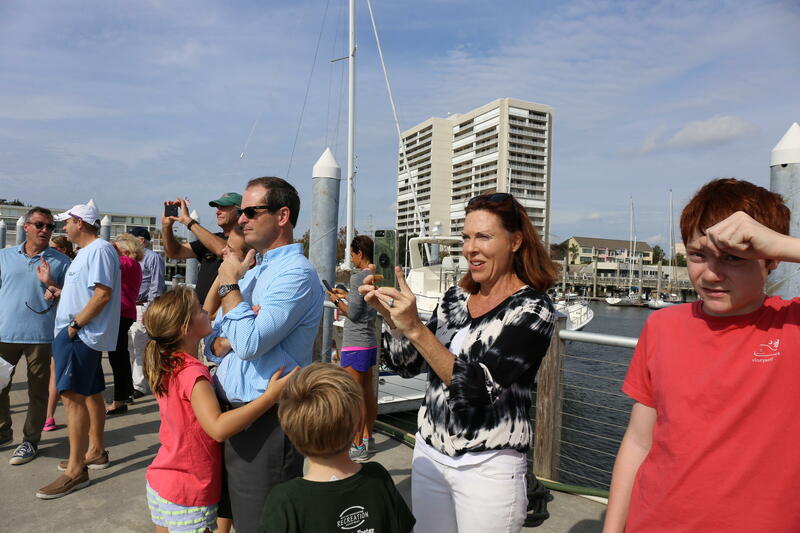 Families welcome home Ashley Hall students in Charleston who have been at sea a week. Families gathered on a dock one Saturday morning in late October to welcome the teenagers home at the Charleston Maritime Center. They waved and cheered as the four-ton tall ship pulled in. The young women, ages 15 to 18 years-old, looked tired and tan, yet talkative, and excited to see their parents and siblings again. They sailed 400 miles from Portsmouth, Va., around Cape Hatteras to Charleston. “Definitely at the beginning, we were not good at any of this,” said Celia Smith, a senior at the school. “I think the crew members were like what are ya’ll doing?" Celia’s been up since 2 a.m. Night watches and around the clock work have left her weary. Shipmates share similar stories of exhaustion and in some cases, sea sickness. So why put teenage girls who have never sailed before on a tall ship in the Atlantic Ocean? School officials say the idea is to create confidence and resilience that will transform the girls into leaders in life. They point to studies that show self-esteem in young women can begin to take a nose dive at puberty; as they try to fit in, fear failure, or become self-critical. They cite a new national survey of 1,300 girls published in The Atlantic this fall that found confidence declining 30 percent in middle school girls. Dr. Roscoe Davis is the head of the Offshore Leadership Program. He on board with the girls and says every year he sees a transformation, even with his own daughter, now 22 years-old, who took a similar trip. Student and shipmate Riley Turner agrees. Celia Smith grins when asked to share the lessons she learned. “Really it teaches me that I love being outside my comfort zone. That it’s awesome to embrace all the new things that it’s through your way, as long you’re really committed to taking them all in," Smith said. The young women learned, much like navigating the seas of life, they may not have been able to control the waves or wind. But they could adjust their sails, and overcome their fears. The teenagers will take what they’ve learned as leaders and mentor third graders at Charleston’s Meeting Street Academy. They’ll help the kids with reading and even teach some to swim. Kitty Goldman says she’s really looking forward to that part of the journey, helping girls younger than herself build their sea legs for life. What advice would she most like to give them? “I would say don’t doubt yourself. That’s something I’ve always struggled with,” she said. “I’ve learned if you make a mistake, it’s not the end of the world. You’ll learn from it and that makes you a better person.